Every year railfans make a pilgrimage to the most unlikely of “hot spots” — Stockton, California, in the heart of California’s Central Valley. The occasion is Winterail, a photography and multimedia show that celebrated its 35th anniversary this year. The drive to and from Winterail is half the fun of going — the other half is seeing old friends and catching up in the dealers’ room. 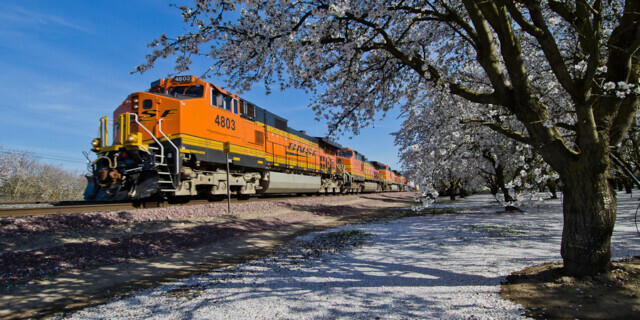 This year I made a little photo gallery of the three-day weekend, including some incredible scenes of almond blossoms that we discovered while following the BNSF rail line near Modesto. Visit the gallery by clicking HERE.